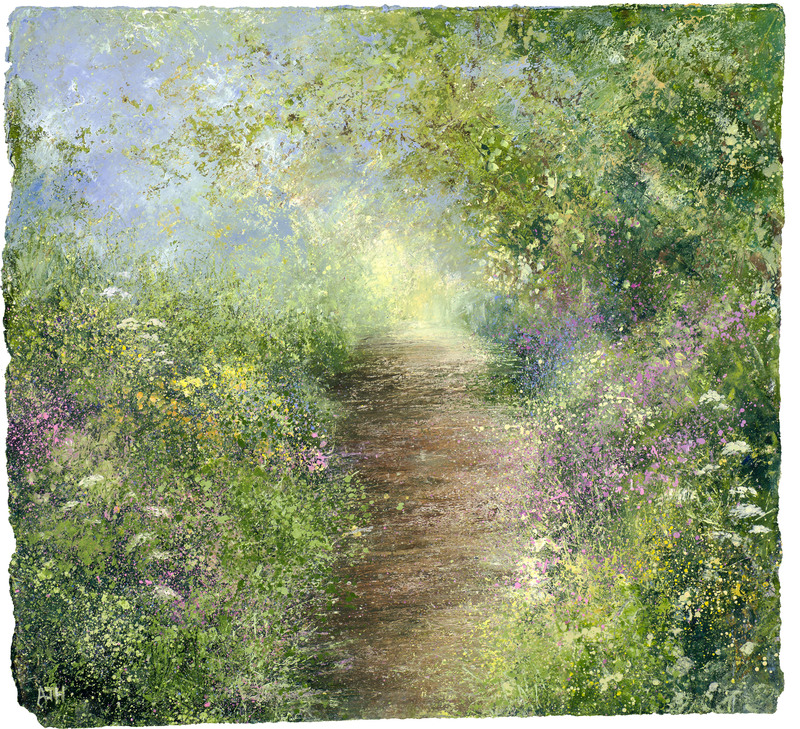 Acclaimed Cornish artist Amanda Hoskin’s annual solo exhibition opens at Beside the Wave, Falmouth, this August with a stunning new collection inspired by the painter’s recent walks along the St Michael’s Way. St Michael’s Way, running from Lelant to Marazion, is one of the ancient routes of Christian Pilgrimage and leads to the Cathedral of St James in Santiago de Compostela, North West Spain. Used by pilgrims, missionaries and travellers to avoid the dangerous waters around Land’s End, the route dates back to the pre-historic times. It was this rich tradition within the walk that sparked Amanda Hoskins’ interest, constantly searching for new ways to experience her beloved Cornish landscape. So, in May of this year, along with her sketchbooks, paints and her Labrador Millie, Amanda walked the route, from coast to coast, in the footsteps of all those who have taken the path before her. 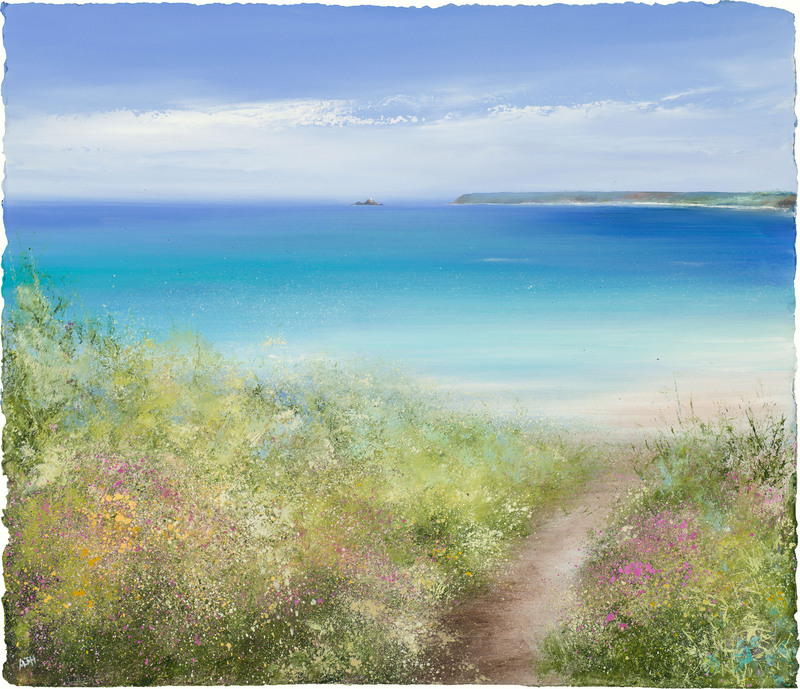 The resulting collection, an impressive 43 paintings, guides you along the route with its impressive sweeps of coastline, bursts of colour from its flower-lined paths and enticing glimpses of the landscape to come. Born in Cornwall, Amanda Hoskin studied at Falmouth and Chelsea Art Schools. After working in London as a freelance wildlife illustrator, Amanda returned to Cornwall in the early 90s to work as a sailing instructor. Constantly painting, she decided to return to art full time towards the end of the 90s and settled in Fowey where she lives and works today. 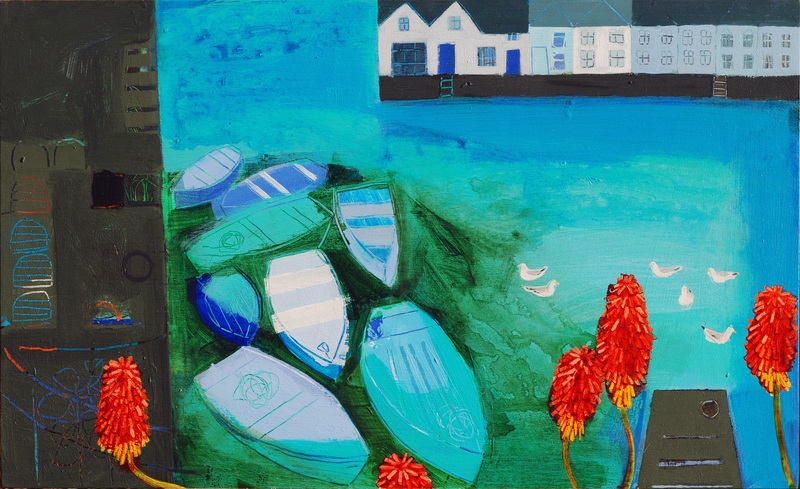 Over the past fifteen years, Amanda has emerged as a leading exponent of Cornish landscape painting. 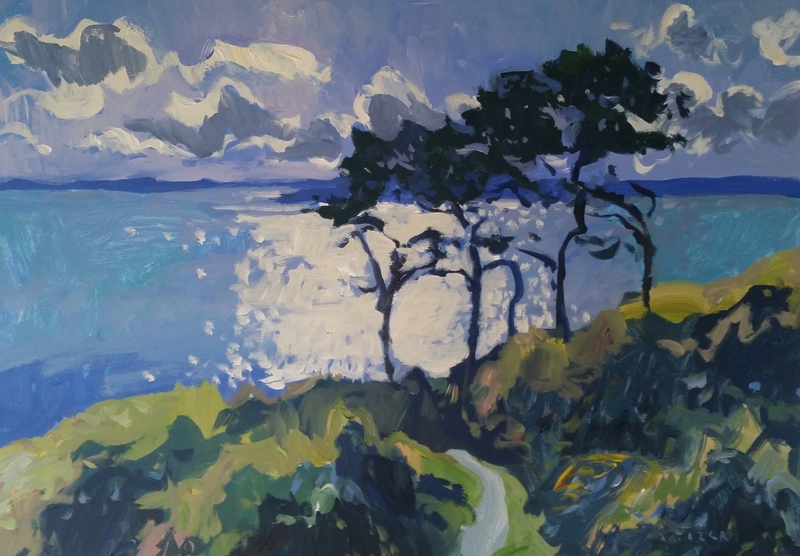 This new collection ‘Amanda Hoskin: St Michael’s Way’ will be on display at Beside the Wave, Falmouth, from Friday 14th August until Thursday 27th August 2015. A book of the new work will also accompany the show, available through the gallery. A new collection of work from celebrated artist Emma Dunbar opens at Beside The Wave London this Friday. Titled ‘Home and Further Away‘, this collection is inspired by her home in Hampshire, as well as trips to Cornwall and Greece. Known for her vivid representations of the everyday, Emma Dunbar graduated in 1984 with a BA (hons) in Fine Art Printmaking from West Surrey College of Art and Design; her training still evident in her use of blocks of flat colour as well as the process of scratching through surfaces to reveal pre- laid colours underneath. Emma Dunbar’s work has been exhibited throughout the UK, including in solo and group shows in Beside the Wave’s Falmouth Gallery since 2007. ‘Home & Further Away’ will be the first special collection of work by Emma Dunbar to be shown in Beside the Wave’s new Primrose Hill space and a fantastic opportunity for London art lovers to find out more about this artist who has built a strong following in the South West in particular. ‘Home & Further Away’ opens at Beside the Wave London on Saturday 15th August and runs until Tuesday 25th August 2015, and all of the new works will be available to view on our website from Saturday morning at 10 am. 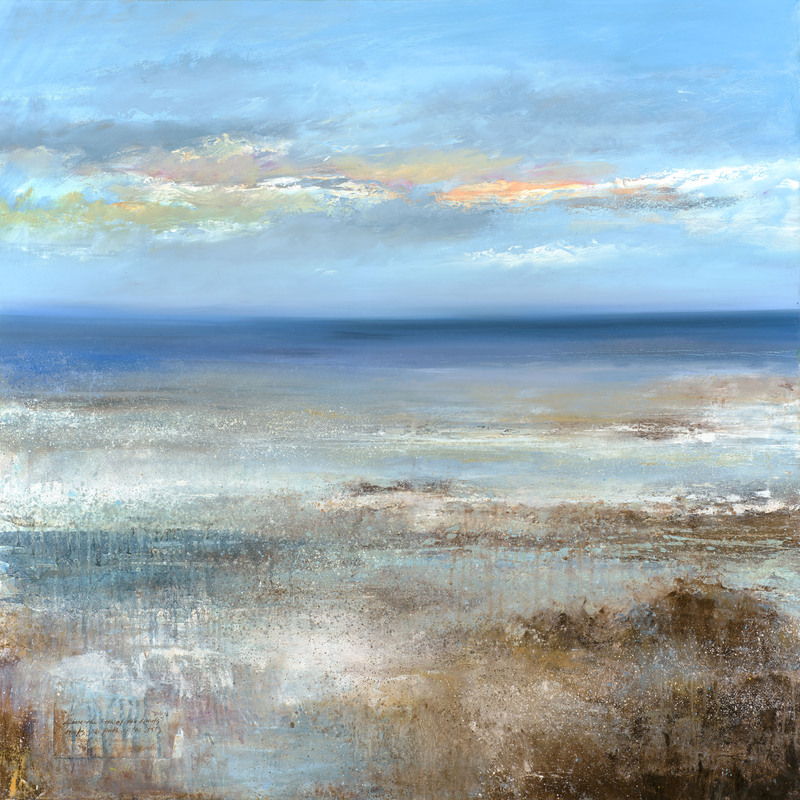 Andrew Tozer‘s beautiful new collection of work, ‘Celebrating the Landscape’ is now available to view in our Falmouth gallery, and on our website. On display at Beside the Wave London at the moment you’ll find our annual mixed Summer Show, featuring a hand-picked collection of paintings, sculpture and ceramics by gallery and guest artists. Running until Thursday 13th August, the exhibition includes the beautifully captured and layered crashing waves of Nigel Chamberlain; ceramicist Catherine Lucktaylors’ masterful raku work, stopping all in their tracks with those incredible shocks of blue; and Emma Dunbar’s vivid still life compositions, showing at Beside the Wave London for the first time. The individual connections that we all experience with artwork is part of the reason why we love what we do so much. Yesterday, the painting ‘Into the Light, St Anthony’s’ by Andrew Tozer sold from Andrew’s current solo exhibition at Beside the Wave Falmouth to a couple with a very sentimental connection to the work. Having met in Cornwall 30 years ago, Sarah and James spent many hours walking together at St Anthony’s and so on seeing this piece of one of their favourite places they “fell in love with the painting right away”. Thank you to them both for sharing their story with us, including a photo of the two of them at St Anthony’s in 1985.